The 89 centimetre long Royal Sceptre set with brilliants, emeralds and sapphires and the top is surmounted by a small round crown. 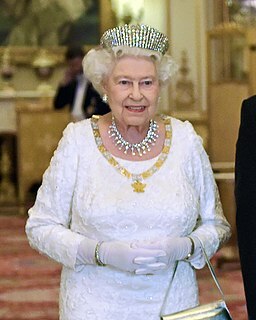 The Palatinate Pearl is also kept with the crown jewels, however it is not officially part of the collection. As a result of the First World War, the German monarchies were abolished in 1918 and since then, Bavaria has not had a monarch. 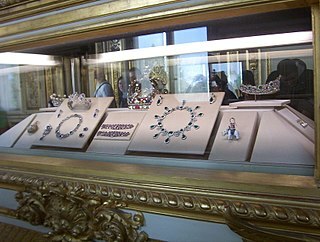 The Bavarian Crown Jewels are currently on display in the Treasury of the Residenz palace in Munich. 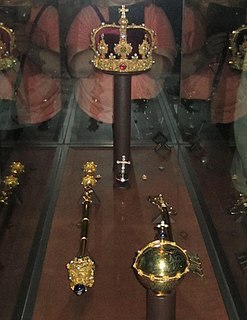 The Crown of the King of Bavaria is a part of the Bavarian Crown Jewels and was ordered and designed 1804–1807 for Maximilian I after Napoleon had raised Bavaria to kingdom status. Albert V was Duke of Bavaria from 1550 until his death. He was born in Munich to William IV and Maria Jacobäa of Baden. The Residenz in central Munich is the former royal palace of the Wittelsbach monarchs of Bavaria. The Residenz is the largest city palace in Germany and is today open to visitors for its architecture, room decorations, and displays from the former royal collections.